Frustrated over an admissions test they say is unfair to minority students, the Buffalo District Parent Coordinating Council said admission tests at criteria-based schools like City Honors, and other "racially discriminatory practices" need to go. 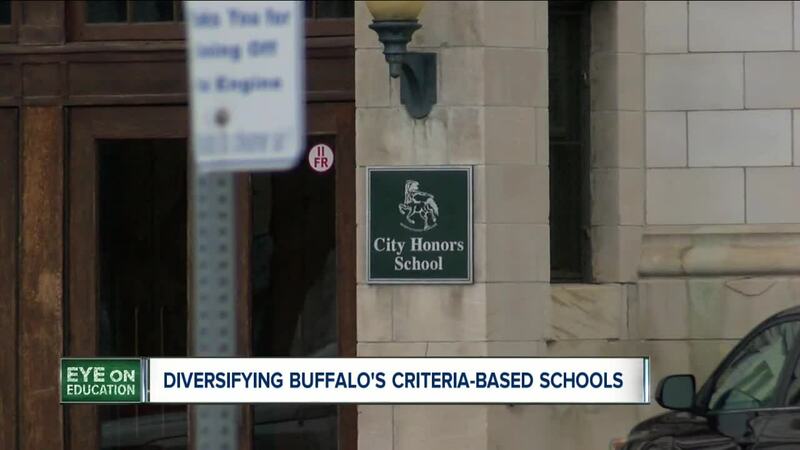 BUFFALO, N.Y. (WKBW) — Frustrated over an admissions test they say is unfair to minority students, the Buffalo District Parent Coordinating Council said admission tests at criteria-based schools like City Honors, and other "racially discriminatory practices" need to go. "The New York State Attorney General's office has agreed to come in and investigate what we are calling the continuing civil rights violations," said Sam Radford, president if the District Parent Coordinating Council. This isn't the first time the council has called for an investigation into Buffalo's criteria-based schools, specifically their admissions policies . Wendy Mistretta's children attend City Honors. She said she does not believe the school's current admissions process accurately measures a child's academic potential. "It measures potential in a nine-year-old," she said. "It's not reliable or valid." A complaint was filed with the Office of Civil Rights. "These are their exact words: there is official finding of a statistically significant lack of black students caused by racially discriminatory practices in the city of Buffalo," said Radford. Will Keresztes, the Chief of Governmental Affairs with the district, said City Honors "celebrates and welcomes diversity in all of its students." "This year for the first time, the majority of students who entered fifth grade were students of color. And we're very excited about that," he said. The Office of Civil Rights made 24 recommendations to the school district. The district fully accepted 19 of those recommendations, but the District Parent Coordinating council does not believe they addressed the core of the issue. When it comes to those recommendations,Keresztes said five were modified because they would have "Caused deep cuts in funding for existing programs or needed further stakeholder input." He added that the district implemented 17 additional reforms to increase access and opportunity for all Buffalo Students.